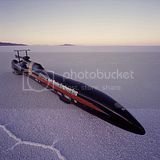 Aug 21, 1991 Bonneville Salt Flats, USA Elwin Teague USA Speed0Motive IC 409.978 mph Set new wheel driven and piston engine mark. For quite a few years, since 1964 to be exact, there exist, de facto, two different Land Speed Records: the 'absolute' Land Speed Record, for vehicles with any type of propulsion, which is dominated by jets and rokets; and the LSR for automobiles, or the wheel-driven Land Speed Record. In 1965 this record fell to the Summers Brothers' "Goldenrod", which took it from Donald Campbell's "Bluebird", at a speed of 409.277 mph. It took twenty six years for an automobile to better that speed, albeit only by a fraction. It was Al Teague's "Spirit of 76" streamliner. Al Teague is a veteran Bonneville racer and he has built himself, in his small workshop, this car, which is quite a different vehicle compared to "Goldenrod" in that it only has one engine, as opposed to four, and rear-wheel-drive, whereas the Summers Brothers' had four-wheel-drive. Faster than "Goldenrod", but not fast enough, everybody thought, to take its mile record: the FIA rules state that the new speed must be at least one per cent higher to be recognised as a new record (the speed over the kilo was more than enough, but for some reason nobody payed attention...). After a few weeks, though, the FIA made it clear that the categories for the official International and World records had changed some time earlier, separating blown and unblown engine classes: Teague's Keith Black Chrysler Hemi was supercharged; the four Chrysler Hemi's of "Goldenrod" were not. The mile record set by the "Speed-O-Motive" (together with the one on the kilo) went in the books, albeit in a different class than "Goldenrod": Category A, Group II, Class 11 (over 8 litres), while "Goldenrod" is in Group I. It doesn't matter: from then on Al Teague was (and still is to this day) in the golden book as the driver (and builder) of the fastest automobile on land! Of course, as we know Don Vesco in 1999 drove his Turbinator to a SCTA/BNI record of over 427 mph, but failed to comply with the slightly more restrictive rules of the FIA. Whatever your opinion regarding sanctioning problems, anyway Vesco's car has a turbine engine, so "Spirit of 76" still is the fastest piston engined or, if you like, "proper" automobile on land... (read "Who holds the "wheel-driven" LSR?" for more details over this matter). Land speed records take a long time to set. Extended development and testing is made more difficult by limited time on the long, flat courses needed to achieve top speeds and availability of the precision timing equipment and crews needed to take speeds and certify records. Al Teague’s approach, as demonstrated in his steady development of the Sadd, Teague & Bentley roadster, has been the essence of patience. Working largely on his own, funded pretty much from his own resources and earnings as a machinist and millwright, helped by friends and associates in the Southern California speed community, Teague took small, patient steps toward ultimate speed. If the Sadd, Teague & Bentley roadster taught one lesson it was the importance of aerodynamics. Variously described as a brick, a barn door and a house on wheels, the biggest, nastiest, most powerful engine that could be adapted to the roadster configuration wasn’t going to push it any faster than the mid-two hundred mile per hour speeds it saw with its big nitro-fueled blown Hemi. Teague and his buddies honored the number 76 roadster with a complete rebuild after its 1972 crash, then polished off its speed record career with the B/BFS record in 1973. It had reached its terminal velocity and a new challenge awaited. It was this car, still the FIA and SCTA record holder in several classes and distances. How it got there is a fascinating account of purposeful, cautious, steady design, refinement and development. Construction began in January 1975 soon after the Red Roadster was retired. The large diameter tubing frame was constructed in Al Teague’s mother’s garage. It was designed to fit under a slim lakester shell molded from a splash taken off a streamliner originally built for Denis Manning’s Norton-powered motorcycle. The idea of using a slender motorcycle streamliner shell for a big blown V8 powered streamliner in itself is intriguing and once again shows Teague’s thoughtful approach to the problems of going really fast. The initial approach was a conventional lakester with four exposed wheels, with a 392 cubic inch blown Chrysler hemi mounted behind the driver taking power through a Weisman four-speed transaxle originally developed for the Ford Mark IVs at Le Mans and Daytona. It made its first appearance at Bonneville in 1976, giving additional meaning to the Teague team’s historic car number, 76, and earning the name “Spirit of ‘76”. In its initial exposed wheel lakester form with torsion bar front suspension it turned a mile at 260 mph in 1976. Its planned next evolution was to grow a set of streamlined wheel pants universally compared with the design of Frank Lockhart’s ill-fated Daytona special. Fortunately Al Teague fared better than Lockhart. It continued to run as a lakester in various forms as Teague and his crew developed experience with it during the infrequent outings which the availability of good salt allowed. Painful development time was consumed by problems with the twin turbochargers initially chosen to pre-pressurize the cylinders. With only a few chances to work out the setup’s teething problems, it took a few years for Teague and his crew to realize it wasn’t going to work and return to the tried-and-true GMC 6-71 positive displacement Roots type blower which had made the Sadd, Teague & Bentley number 76 Red Roadster so successful. In lakester form Teague ran the mile at 308 in 1981. During the 1982-83 rainout at Bonneville, Teague made the decision to minimize frontal area. The rear wheels were pulled in tight to the transaxle. Something more dramatic was required to give the streamliner the aerodynamics of an arrow. In its first passes in 1984 only 268 mph was on tap but it turned its fastest speed in 1985: over 353 mph. The rear wheels had been exposed on that run. For 1986 they disappeared under faired-in bodywork. The old standby 392 iron block hemi was retired in favor of a new aluminum block Keith Black hemi built by the skilled craftsmen at Gale Banks engineering. That elevated the 1987 speed to 360 mph. Tires, the bane of Bonneville LSR speed merchants in the 80s, became a problem in 1988, blistering and even peeling the treads in the heat generated by trying to hook up 1,800 or so brake horsepower and the centrifugal forces of 400 mph speeds. Teague recorded his first 400 mph speed through the traps at the end of a run in 1990. It wasn’t sufficient to record a record over a measured kilometer or mile but it showed the streamliner’s aerodynamics and drivetrain were up to the task. The record was still in doubt. It was held by Bob and Bill Summers’ “Goldenrod”, powered by four hemis at 409.277 mph in the mile and 409.685 in the kilometer in 1965. That epic day came on August 21, 1991 when the Speed-O-Motive streamliner with Al Teague at the controls turned a one-way run at 425.230 (with a trap speed of 432 mph) and backed it up at 394 mph for a two-way average of 409.978 mph, besting the Summers brothers by a tiny margin but doing it in a supercharged single engined car. The kilometer mark set on those runs was an even more impressive 425.050 mph. Those records, in the current FIA Category A1, Group I, Class 11, still stand. Development continued and in 2002, in Al Teague’s last runs at Bonneville, he set yet another record, recording speeds of 406.321 mph in the kilometer and 405.862 in the mile in Class 10 which, like the 1991 records, still stand for the Teague-Welch-Banks streamliner. Over this car’s life as a lakester and streamliner it has set sixteen FIA and SCTA records, an unprecedented history of power, performance, development, aerodynamics, construction and persistence which is probably unmatched by any combination of car, builder and driver except for the prolific Ab Jenkins with his Duesenberg Special and the Mormon Meteors. Its 432 mph trap speed set in 1991 remains the fastest speed a wheel-driven automobile with a single internal combustion engine automobile has ever achieved. Familiarly known by Teague and his team as “Old Betsy”, this epic accomplishment of individual drive, determination and inspired design and development has been meticulously prepared as if for another run across the Bonneville salt flats. She was acquired directly from Al Teague liveried in her 1991 “Speed-O-Motive” colors and proudly bearing the legendary number 76. In 2001 Hot Rod magazine included Al Teague’s Spirit of ’76 in its summary of the “20 Fastest Hot Rods of All Time”. The counterpart to the history and accomplishments of “Old Betsy”, the Summers brothers’ “Goldenrod”, is now proudly ensconced within the collection of The Henry Ford in Dearborn. “Old Betsy” is registered in the state of Nevada with the assigned VIN DR941194T ... as a trailer. She’s hardly large enough to haul the heavy load of history tightly packed within her composite skin. In 1995 Al took old Betsy to South Australia’s Lake Gairdner for the Dry Lakes Racers Australia Speed Week.